Nature's Cupboard is your neighborhood source for organic ingredients, local meat and produce, wholesome snacks and kitchen goods, fresh organic juice, and lots more. We're locally owned and proud to serve Northwest Indiana since 1980. We work with the Independent Natural Food Retailers Association (INFRA), a buying co-op that represents over 300 independent natural food retailers across the country, to bring you monthly sales with thousands of deals. INFRA shares our commitment to the highest quality standards and gives us an opportunity to offer you the best possible prices on your favorite natural and organic products. Order by 10pm on Saturday & your produce will be ready for pick-up after 3pm on Tuesday. We source from local farms across Indiana and Michigan for meat, dairy, eggs, produce, and more. Keeping family farms and small businesses alive ensures that we'll continue to have good food choices available in the future. Now more than ever, it's important to eat local and shop small! We leverage the purchasing power of the Independent Natural Food Retailers Association to get bulk pricing on natural and organic food items. In addition to our monthly specials, we have fantastic prices every day on staples like GT's Kombucha ($2.99) and Food for Life bread ($4.99 for a different variety each month). 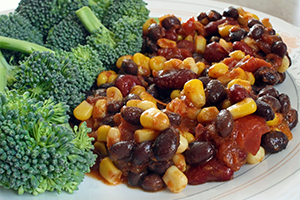 An excellent source of molybdenum, fiber, vitamin C, and folate, this is an alternative chili that can be served as a meal in itself or used in many dishes such as soft tacos, tostadas, frittata, or enchiladas. The Healthy Sauté cooking method makes this recipe even healthier because it is prepared without the use of heated oils.